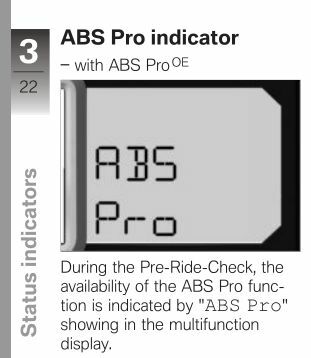 During the Pre-Ride-Check, the availability of the ABS Pro function is indicated by " ABS Pro " showing in the multifunction display. I have X5ACA ABS pro (decoding the vin and reading the invoice :-) ) but I have never seen this writing. The service-due date shows when a service is due within one month. down in steps of 100 km (US model, 100 miles). This reading appears briefly after the Pre-Ride-Check completes. Next service is at 10.000km, now I have 9500km, never seen this wtiting again. I don't have this in my English manual. The only ABS indication is the yellow light on the left side of the dash. I think it depends from the year of construction.If I'm not mistaken it should be available from 2016 ? Mine is a 2016 and supposedly has ABS Pro, but I also do not get this message on start up. I am going in for my 6k mile service this weekend, I am going to ask my dealer about this. My owners manual says the same thing, but I must admit, I've not seen this on my dash display, 17 model. Ditto, mine is a fully loaded 2017 and I've never seen the ABS pro come up on the pre-ride? Its an error in the owner's manual. It has been carried forward from the RR and R model manuals, but the XR dash does not display this. Even the 18 models.